my B.O.B. - Pink Mahoghany — myblackbox co.
We were happy to introduce Chavalia, owner of Pink Mahoghany through our my B.O.B. campaign on Instagram! This campaign brings awareness to Black businesses from the owner's perspective. At blackbox we believe it's important to know the vision and purpose behind a business. Through our blog, we can dig deeper into their stories and provide a fuller perspective with you! 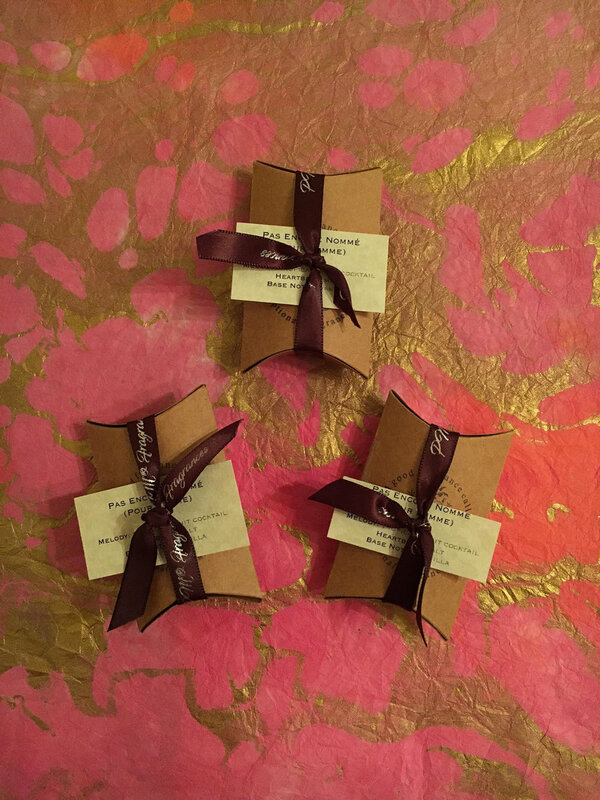 After an allergic reaction to the chemicals commonly found in our favorite home and body fragrances, Chavalia decided to do more research on the ingredients that were contained in these scents and create her own line, Pink Mahoghany. Tell us how you became a fragrance designer. What's your background? I was born with an acute sense of smell and even from childhood, I would mix various products together to figure out what the result would be from combining. I've always been a fine fragrance aficionado and the fragrance department was (and still is) my favorite section in any store to visit. My mother used to take her precious time when shopping, so I found that fragrance was my escape to forget about how long we'd been in a store! The more I visited various fragrance departments, the more I became acclimated to the way certain designer fragrances smelled and could recognize their themes instantly. It was like I'd created my own miniature master class to test my scent knowledge. Once I began purchasing perfumes and scented skincare products for myself, my interest in who actually designed them grew. I knew mainstream fragrances carried the name of the brand (i.e. Ralph Lauren, Beyoncé, Yves Saint Laurent, etc. ), but I wanted to know more about the process of creation from the actual designer/perfumer, so I did what anyone else would do and began researching online. This research turned into years of studying, and once I found access to complimentary perfumery courses that were invitation only, I jumped at the opportunity to apply. In the meantime of being accepted, my sister-in-law introduced me to several online boutiques that sold exclusive and niche perfumes, and that's where my interest piqued. I bought samples of perfumes to wear at least once a month and purchased small sets of materials to blend with to train my nose. I studied various perfumery blending methods and set aside a space in mine and my husband's condo to carry out the many trials. Once I determined that phthalates were indeed in the products my husband and I were buying, that alone motivated me to not only discontinue use of them but to pay closer attention to the ingredients and materials I purchased to create my own products. I beta-tested on friends and family with known allergies and asthma, and when they reported no adverse reactions, I knew I was onto something. In the world of fragrance, there are so many choices. How do you select a certain scent to become a part of the Pink Mahoghany line? I tend to work in themes - often with a male and female fragrance complement, so when I sit down with an idea, I usually write out my thoughts before blending anything. Sometimes those thoughts aren't well-translated into a perfume or room spray, so I regroup and start again. If a blend is an excellent translation of what I envision, and after its beta-tested it passes the "bar", I deem it worthy of being shared with the public. For example, with one of my men's fragrances called Gent, it's the masculine complement to Pas Encore Nommé, a women's perfume in our collection. Both contain pineapple as one of the heart notes, but the interpretation and delivery are totally different. Where Pas Encore Nommé is a sweet, almost edible (gourmand) fragrance, Gent is a soft spicy-woody scent that represents its name well. What were some of the challenges when starting your business and how did you overcome them? Working on a small, made-to-order scale, in a sector where minimum order quantities average about 15,000+ unit purchases for packaging materials, can be quite frustrating, and upon the inception of PM®, that was an ongoing challenge I encountered. I spent countless hours a day emailing, calling and even reaching out to fragrance colleagues and contacts, but the lowest I was given was about 5,000-7,000. With that still being a little high, I began to seek outsourcing companies such as Alibaba to find lower minimums with a good cost-per-item ratio. Still mostly unsatisfied, I decided to find companies that would wholesale basic packaging and use my creativity to make it my own. This has been years of progress (since 2011), but with the evolution of Etsy and social media, I've been able to network and find wholesalers who provide exactly what I need in the amount desired at a great cost. Through patience and dedication to staying eco-luxe, I can say I've finally jumped such a high hurdle, though I'm constantly seeking to improve. What can we expect to see from your business in 2018? With the product addition of room sprays and aromatic diffuser blends, I want to increase brand visibility and partner with home goods and bedding stores. I also desire to expand into providing phthalate-free, bespoke scent solutions for custom home builders, restroom facilities and luxury vehicle rental establishments. What a pleasure learning more about Chavalia and Pink Mahoghany; we are excited to see her pursue those goals for 2018 and continue to grow. Pink Mahoghany is happy to offer our readers FREE SHIPPING using code: MELANIN17 at checkout.